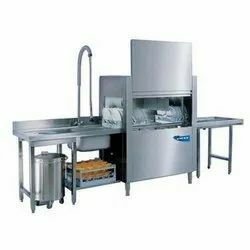 Prominent & Leading Manufacturer from New Delhi, we offer three sink dishwashing unit, stainless steel single sink, ss sink table, dish landing table, sainless steel sink table and hood type dishwasher. We are offering Three Sink Unit to our clients. 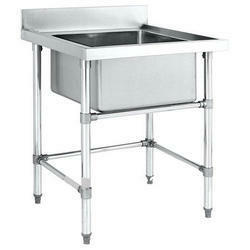 1) Sink top made in heavy duty 16 gauge stainless steel material. 2) Sink bottom made in 16 guage 25mm square pipe with gloss polishing. 3) Sink Legs made in heavy duty 16 gauge stainless steel material. 4) Sink frame work made in 32mmx32mmx3mm mild steel. 5) Sink comes with height adjustable nylon bullet feet for better staibility. 6) Our sink designed with low water wastage techonology with ease of cleaning. 7) Our company use stud welding technology for better finishing of equipment. 8) Our sink fitted with sound deadener rubber lining for noise free cleaning. 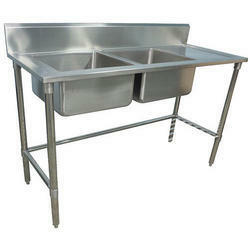 9) Sink made in 16 guage heavy duty stainless steel material. 10) Sink comes with heavy duty brass drain waste for rust free cleaning. Packaging Details: Poly Wrap Packing. 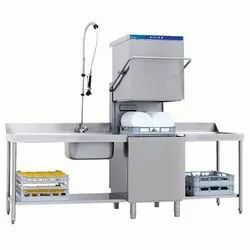 We are offering Single Sink Unit to our clients. 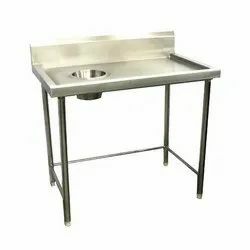 We are offering SS Sink Table to our clients. We are offering Dirty Dish Landing Table to our clients. 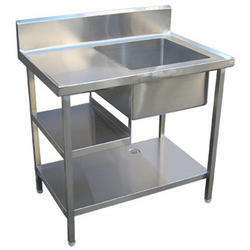 1) Table top made in heavy duty 16 gauge stainless steel material. 2) Table bottom made in 16 guage 25mm square pipe with gloss polishing. 3) Table Legs made in heavy duty 16 gauge stainless steel material. 4) Table frame work made in 32mmx32mmx3mm mild steel. 5) Table comes with height adjustable nylon bullet feet for better staibility. 6) Our dishlanding table designed with low water wastage techonology with ease of cleaning. 8) Our Dishlanding fitted with sound deadener rubber lining for noise free cleaning. 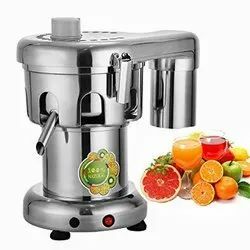 9) Garbaje chute made in 16 guage heavy duty stainless steel material. 10) Dishlanding comes with heavy duty brass drain waste for rust free cleaning. 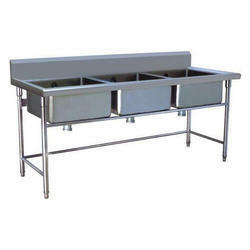 We are offering Stainless Steel Sink Table to our clients. Our clients can avail from us Kitchen Appliances, which we procure from Indulge. These easy to use appliances are durable and are developed using quality tested raw material. Our durable appliances are preferred by clients due to their low maintenance cost and higher efficiency. 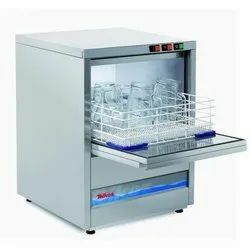 Available in varied specifications, these appliances can be availed at industry leading prices. Standard basket is provided with 5,5 mm diameter holes. Height of the spout 8" (200 mm) allows for use of high glasses or containers. Wide circular feeding hole (diameter 79mm;3") no need to cut fruits or vegetables. Patented locking-unlocking system with special lever. 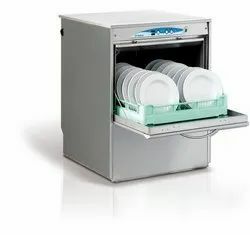 All removable parts can be put in a dishwasher or easily cleaned with hot soapy water (NSF approved). Version 50 & 50C (220-240V-50/60Hz) : CE, GS, RoHS. Versions 50V1 & 50CV1 (100-120V-50/60Hz) : CE, UL, NSF, RoHS. Perfect ergonomics and maximum strength with a door clearance of 330mm. Pizza dishes are not a problem anymore! We are offering Conveyor Dishwasher to our clients.Our products are demanded by various client at competitive and leading Prices. We are offering Teikos Products to our clients.Our products are demanded by various client at competitive and leading Prices. A step forward in environmentally friendly products. Teikos' production is completely designed and manufactured in Italy. All stages of production are highly controlled. Before the machines leaves the factory, they are tested one by one with water, electricity and temperature, to guarantee the customer strength and longevity, reducing the need for warranty work. Thanks to the standardization of the components, Teikos Dealers are able to act quickly to meet any Customer's needs. A satisfied Customer is a Customer who will always bring in good publicity! For washing and rinsing, we use high-efficiency pumps, carefully sized, to reduce consumption and respect the environment, with very high performance results.We have minimized the use of plastic parts, most components are electromechanical, and upon Customer's request, the technical staff can customize the duration of washing cycles; the thermostats, that manage the temperatures of washing and rinsing, are both adjustable for a perfect set-up. The removal of parts for maintenance and routine cleaning is performed without the use of tools. Our philosophy is to offer to highest quality products without compromising. Door height of 30cm with a machine total height of 66cm only(feet included)! Beer glasses and ice-cream cups are not a problem anymore!